We have MP3 samples of some of our music on line. Check ’em out. 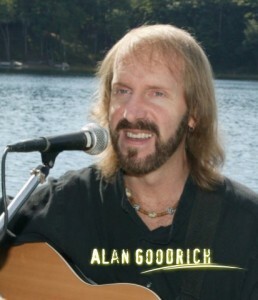 A long-awaited solo album from Alan Goodrich, “Out On A Limb,” released in 2005, is the essence of Alan’s passion for music and the craft of songwriting. The majority of the original songs on this new CD are in the “acoustic rock” or “singer-songwriter” style with catchy melodies, strong vocals and guitar playing. Musical styles vary from rock, blues, and acoustic pop, to electr ic rock, funk, and even some “jam band” style stretching out. Alan is joined on guitar on several tracks by former Alligators band-mate Erik Ringstad, and also Bruce Marshall of Toy Caldwell (Marshall Tucker) Band fame. “Out On A Limb” features Alan playing a variety of instruments including drums, guitar, percussion, bass guitar, and even clarinet. The CD has 13 new tracks and four bonus tracks, clocking in at over 62 minutes of music. Most of the songs on “Out On A Limb” were written solely by Alan. There are also some collaborations on the CD where Alan co-wrote songs with Kristin Herther, Erik Ringstad and Squire Mahoney.